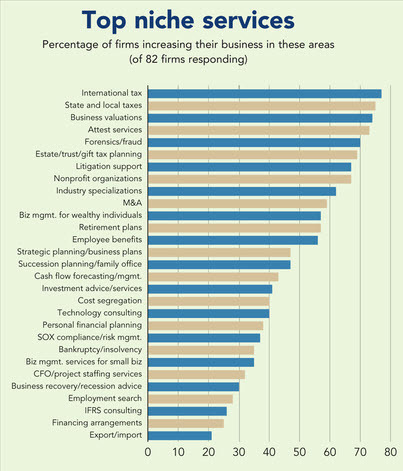 Tax services were a large source of growth for the 2012 Top 100 Firms, with both international and sate and local taxes making big gains to top the list of the fastest growing niche services areas. International tax services ranked first, making one of the biggest leaps, of nearly 11 percentage points and five spots from last year, with 77 percent of firms reporting growth. State and local taxes were close behind, with 75 percent of firms reporting an increase, catapulting the niche up six spots this year to second on the list. Business valuation, though overtakes from 2011’s top spot, remained steady and down only one percentage pint, with 74 percent of firms tracking expansion. Attest services made a big climb of nine percentage points to 2012’s No. 4 spot, but with 15 percent more firms reporting growth than in 2011, this year’s biggest climber was cash-flow forecasting and management—up eight spots to 43 percent.